Ready Steady Cook (BBC2, 4.30pm weeknights) doesn't bother with boring members of the pubic as contestants now. Instead, its kitchens are a celeb-only zone (well, we say celebs, we mean minor characters off Holby City). But last night, they had Mansfield superstar Becky Adlington and her mum Kay competing to win that special Ready Steady Cook plate thing that has "straight to eBay" written all over it, plus the chance to donate money to charity. We used to like the lovely Fern Britton as presenter but, of course, she defected to ITV years ago. So now we've got former Ready Steady chef Ainsley Harriott. 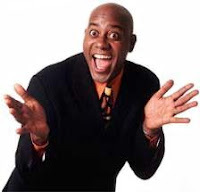 We used to think the problem with Ainsley was that he wasn't quite used to being a presenter yet. He's always awkward and gurning. But it's been about 10 years, for pity's sake. 10 YEARS! And Ainsley still behaves with the gritted-teeth bonhomie of your dad at a dinner party, trying to cover up for the fact there's been some massive family row. The outsized helpings of forced jollity drive us insane. Becky, she of the golden hair and the golden medals, confessed she wasn't actually an amazing cook. That was good - we'd be far too jealous otherwise. Her "goody bag" contained steak, an enormous potato, cheese, brocolli and a carrot that rolled on to the floor. "We'll WASH IT, it's alright!" cried Ainsley to the viewers, already in a tizz. Is he worried about being the subject of a letter on Points of View or something? Then he told Becky she could put the broccoli in a flask and take it to training. Hah? Over on the other side (the red tomato kitchen), Becky's mum Kay had one of those fab Italian chefs called Aldo, who says everything once in English, then repeats it in Italian. As in "Perfect! Perfecto!" He thought he'd do soul meuniere with the fish Kay had brought. "With the rest, you will see something you have never seen before" he said, with Mediterranean panache. "Ooooooh!" went the audience. "Making it up as he goes along" we thought. Kay is, apparently, an excellent cook. It runs in the family. "My nan-ah was a dinner lady and she was brilliant," she says. The 20 minute countdown began, as did Ainsley's questions of randomness to his guests. But he actually managed to uncover a scoop. 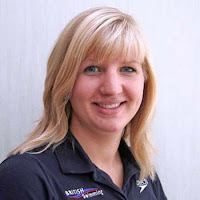 Did you know that Becky Adlington, winner of two Olympic gold medals for swimming, doesn't like the sea? "I love water, I just don't love it with fish in it," she says. "It's fear of the unknown. Sharks and things that might eat you." Aldo the Italian, clearly had no such qualms and was busy slitting Kay's lemon soul and sprinkling it with salt. "Becky won't eat fish," adds Kay. "She won't even come in the kitchen when I'm cooking fish." We reached the grand finale, which is always amusing, because it involves our contestants trying to simultaneously scoff five dishes and go: "Mmmm! It's lovely!" Of course, Becky, in the green pepper kitchen, won. She is the nation's sweetheart, after all. And the Asian steak thingy with cheesy bread looked "Mmmm! lovely!" "Here's a woman who achieved a challenge in the water, along with her mum!" cried Ainsley, in a confusing summation. Now, we have to say, our eyes were very bleary when we watched Becky achieve her Olympic glory. But we never noticed her mum splashing around in there with her. Maybe she was fending off the fish?